Dave Steckel looks to improve off a 1-10 first season. The Missouri State Bears kick off their 105th season of college football and 75th season at Robert W. Plaster Stadium on Thursday (Sept. 1) when they welcome the Southwestern Moundbuilders of the NAIA to Springfield for a 6:04 p.m. non-conference contest. The visitors from Winfield, Kan., are coming off a 3-8 campaign last season. 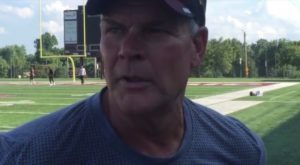 Missouri State head coach Dave Steckel is in his second season on the sidelines as he brings back 15 starters, 39 lettermen and 57 total returnees. A trio of returning Bears earned Preseason All-Missouri Valley Football Conference honors earlier this fall, led by All-America linebacker Dylan Cole, who posted 152 tackles last season — the most by any returning FCS player. Return specialist Deion Holliman was also on the conference’s elite preseason list after he led the nation in total return yards (1,233) in 2015. Sophomore safety Jared Beshore was also recognized on the Valley preseason list after he finished third on the team with 70 tackles as a freshman. There are also six Division II games scheduled for Thursday night. Preseason 20th ranked Central Missouri has a tough MIAA road test at Pittsburg State and the defending national champs and preseason ranked number one Northwest Missouri State plays at Emporia State. The Bearcats prepare for their run at a sixth national title. Central Missouri Pittsburg State 7 p.m. Pittsburg, Kan.
University of Central Oklahoma Lindenwood 7:00 p.m. St. Charles, Mo. Missouri Southern Fort Hays State 7:00 p.m. Hays, Kan.
University of Nebraska at Kearney Missouri Western 7:00 p.m. St. Joseph, Mo. Eastern New Mexico Southwest Baptist 7:00 PM Bolivar, Mo.